During a scuba dive, nitrogen from your breathing air dissolves into body tissues due to the increased pressure. The deeper you dive, the faster nitrogen dissolves into your body. It’s important to keep this dissolved nitrogen within accepted limits to minimize the risk of decompression sickness. To do this, your dive computer tracks your dive depth and time. It calculates theoretical nitrogen using a decompression model and displays the time and depth limits you need to stay within. There are two basic styles of dive computer. Independent – These computers are separate gauges that you wear on your wrist or as part of an instrument console. Integrated – These computers integrate with your SPG and/or other instruments, such as an electronic compass. By also measuring your air supply, some models can estimate how much time your remaining air gives you based on your depth and how fast you’re breathing. Easy to read display – You consult your computer constantly while diving, so choose one that makes sense to you and that you can read easily. Low battery warning – Once activated, a dive computer will need to run 24 hours or longer to calculate changes in dissolved nitrogen. The computer must be able to warn you if it won’t have enough power to do that. Virtually all modern computers have this feature, alerting you to change the battery before starting your dives. Enriched air compatible – This allows you to set the computer to dive with enriched air nitrox.Enriched air gives you longer dive times, all else being equal, and the setting tells the computer to track your exposure to oxygen. At one time considered an option, today diving with enriched air nitrox is so common that you’ll want to become qualified to use it shortly after becoming a PADI Open Water Diver. Virtually all modern computers have this ability. There are many options in dive computers. Some of these are very important for specific types of diving, whereas others are personal preference. Hoseless integration – Some integrated computers receive air supply information from a transmitter on the regulator first stage. This eliminates a hose and allows you to wear an integrated model on your wrist. Multiple gas – Aimed primarily at tec diving, you set these models for two or more different types of enriched air or even trimix (a tec diving blend of helium, oxygen and nitrogen). This allows the computer to calculate as you switch gases during the dive. Audible warnings – Most computers sound an alarm if you ascend too fast or near a limit. Computer download – Some computers interface with your PC so you can download your dive data. 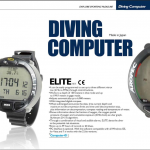 This provides detailed dive information and is a convenient way to keep a computerized dive log. You can also purchase a PADI paper log book from us. Choosing a dive computer is a matter of personal preferences and cost-versus-features. Get your PADI Instructor or a dive professional from Expediton Dive to help you. The options and choices can seem overwhelming, but your PADI pro can narrow it down very quickly by asking you a few simple questions. Don’t share it and don’t turn it off. A dive computer tracks changing theoretical gas levels for each individual diver during a dive, between dives and during a second dive. Therefore, you can’t share it during the day. If you turn it off, it loses its memory of your previous dives (not good! ), which means you can’t dive any more for at least 24 hours. You can’t turn off most modern computers, but changing the batteries during the middle of the day can be a problem. See the manufacturer instructions. User settable alarms are awesome. It’s great to have a computer with automatic warnings, and new divers shouldn’t turn the alarms off indiscriminately. On the other hand, some warnings are annoying and unnecessary for experienced divers, so it’s nice to have the option to turn them off.